150L050 TIMING BELT. 15 inch Length, 0.3750" Pitch, 40 teeth. 1/2" Top Width. Home > Timing Belts MXL-XL-L-H... > L Timing Belts. 3/8" Pitch Trapezoidal Tooth Gear belts. > 150L050 TIMING BELT. Industrial Grade. 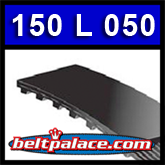 150L050 Bando Industrial Grade Timing belt. 15" Length, 3/8" (0.375) Inch pitch, 40 teeth. 1/2" Top Width. 150L050 TIMING BELT. 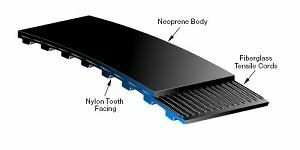 Used in woodworking tools, office machines, machine tools, postage equipment, sewing machines, vending machines, agriculture, outdoor power equipment, food processing, HVAC, oil fields, wood, paper, sand and gravel applications.